“Tried by War: Ab raham Lincoln as Commander in Chief” is James McPherson’s 2008 biography focused on Lincoln’s role as the nation’s chief military strategist and tactician during the Civil War. McPherson is a historian, Professor Emeritus of History at Princeton University and a prolific author. His most notable work is “Battle Cry of Freedom” (the standard one-volume history of the Civil War) for which he received a Pulitzer Prize in 1989. 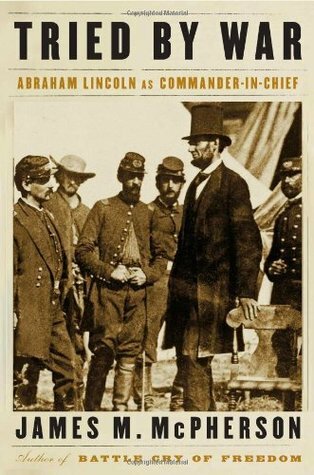 In the book’s preface, McPherson asserts that most Lincoln-related literature pays disproportionately less attention to Lincoln’s role as commander in chief than is deserved based on the time he devoted to that task. This, it seems, is his rationale for authoring “Tried by War.” And as promised, rather than writing “yet another” biography of Lincoln’s life, McPherson spends all 270 pages focused on Lincoln’s presidency – with the substantial majority focused on his prosecution of the war. Notwithstanding his claim, the majority of the almost nine-thousand pages I’ve read on Lincoln the past three months (excluding chapters focused on Lincoln’s youth) was spent reviewing, discussing, and analyzing Lincoln’s role as commander in chief. But while I found McPherson’s justification for writing this book somewhat spurious, I was undeniably interested to experience this renowned Civil War historian’s perspective on a presidency consumed by war. Happily, the book’s pace as well as the author’s insight into Lincoln’s management of the war are terrific. “Tried by War” is easy to read and understand, and proves consistently informative and entertaining. Where some Lincoln-oriented biographies become bogged down in dull explanations of war tactics or troop movements, this book appears calibrated for a younger, less patient audience. However, little about McPherson’s book is truly unique. Given the author’s background, I expected deeper analysis and a richer, more robust interpretation of Lincoln’s actions during the war. Although McPherson frequently demonstrates his mastery of the subject, broad swaths of the commentary are superficial and breezy. And while the book contains new information concerning some of Lincoln’s military leaders and a few battles, none of it is important enough to alter the complexion of Lincoln I’ve gleaned from other biographies. Readers seeking special insight into the war’s great battles, or overall military strategy, will also be disappointed. Although “Tried by War” is not intended as a Civil War primer (and makes no attempt to supplant the excellent “Battle Cry of Freedom”) McPherson’s focus is almost exclusively on Lincoln and his management of the war. The Battle of Gettysburg, for example, is dispatched in just two sentences. Rather than writing a potent, fresh study of Lincoln’s life from an unconventional perspective it almost seems as though McPherson has taken a standard six- or seven-hundred page biography of Lincoln and condensed it dramatically by removing Lincoln’s pre-presidency and a great deal of the interaction with his mercurial cabinet members. Rather than seeing Lincoln from a new perspective, I simply saw Lincoln from only one perspective. Interesting though that perspective was, I find found the book limiting rather than revealing. Overall, James McPherson’s “Tried by War” is an educational and entertaining book best suited for readers already acquainted with Lincoln who seek incremental insight into his management of the Civil War. For readers looking for a comprehensive cradle-to-grave analysis of Lincoln’s life and presidency, this book is clearly less appropriate. But for its intended purpose, “Tried by War” is usually satisfactory and sometimes extremely satisfying. There’s another book by McPherson, titled “Embattled Rebel,” that does the same sort of analysis, only from the perspective of Jefferson Davis. I found “Tried by War” to be the better book, but they do go together very well. Long-time follower, by the way. Started when you covered Jean Edward Smith’s Grant biography, and then proceeded to buy all of his stuff that I could find. I’ll be reading his Lucius Clay book in a week or so. Thanks for the note – and thanks for the tip on McPherson’s “Embattled Rebel” which I wasn’t aware of, but which sounds fascinating. And you MUST let me know what you think about JES’s Lucius Clay bio. It’s one of his older biographies and the subject is a bit eclectic so I’m interested to hear what you think.